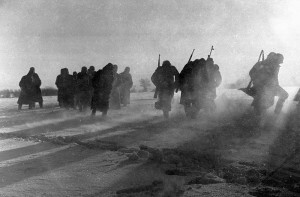 Operation Typhoon involved over three million men on both sides of the eastern front. Such a figure is hard to comprehend and the truth is, even as an historian, it’s easy to lose sight of the human dimension in this war. That was brought home to me last year during a trip to Russia and the battlefield of Viaz’ma. Viaz’ma was the great German encirclement that broke open the Soviet front at the start of October and started the Germans down the road to Moscow. I visited the battlefield with a group of government-approved “searches” who dig up these battlefields looking for artefacts as well as Soviet war dead. At first glance the forest appears like any other in northern Europe, but once the metal detectors are turned on the forest floor reveals that the battlefield is just below the surface. Literally every few steps yields new discoveries. Most of these are harmless objects – parts of weapons, helmets or shell fragments, but not infrequently unexploded grenades and other ordinance are dug up making it easy to see why one searcher on average dies every year in Russia. The fact that Hitler’s war in the east is still claiming Russian victims may also suggest why the Nazi-Soviet war is still so very much a part of the Russian national identity. For my part the piles of artefacts coming up out of the ground were a stark reminder of the scale of this battle, but it was still all oddly detached from reality. Where were the men who fought here? The only clues were fragments of bone or the odd personal effect from an unknown man. The searches told me that very few bodies are recovered, on average one is found at Viaz’ma each summer and even then it is extremely unlikely that he will ever be identified. Soviet soldiers in 1941 did not have “dog tags,” but rather small capsules in which their personal details were recorded on a small piece of paper. Even if a capsule was found, the seepage of moisture usually ensured that the identity of the owner would never be known. After many hours in the forest we were preparing to leave with a van load of artefacts destined for the local museum. We’d already started the long walk back to our 4WDs when one of the Russians came running and asked us to return. A body had been found and was carefully being dug out of the ground, one bone at a time. We arrived to find the man’s leg arranged on a dirty blanket next to his grave. Over the next hour the rest of the skeleton, along with gas mask and personal effects were removed from the ground. His lower jaw still had its full set of teeth. As the work proceeded I think even the experienced searchers felt the heavy silence, a mixture of solemn disbelief and unspoken reverence. Eventually even his capsule was recovered and that night in a controlled room (to protect whatever remained of its contents) it was opened for the first time since 1941. The paper was still intact and the name legible. Without the family’s permission I shall not record his details here, other than to say his first name was Sergei. 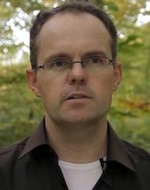 The man’s younger sister was still alive and in September 2012 was informed that her brother had been found 72 years after he went missing at Viaz’ma. A month later Sergei was reburied with his family present and full military honours. Sergei’s story reminds us that behind the faceless enormity of the Nazi-Soviet war there are millions of family tragedies. Yet beyond simply representing all those who died, I would like to think he also represents something more enduring. Sergei is why we continue to read and write the history of the Nazi-Soviet conflict. 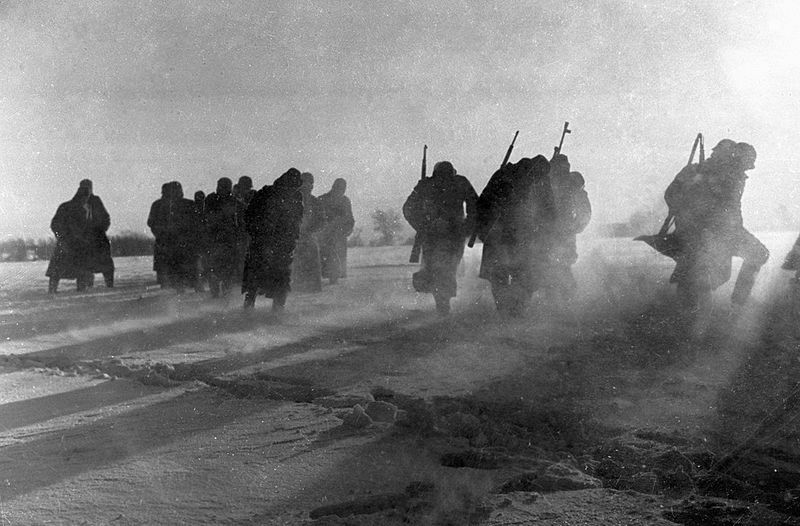 Image: German soldiers going to surrender on a snow-covered field near Moscow, December 27, 1941. Source: RIA Novosti archive, via Wikimedia.